There’s my new camera and a new script in the picture. 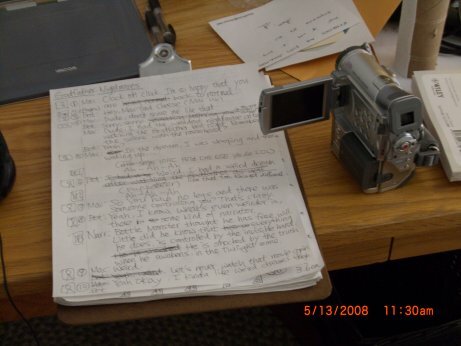 I got the camera last week and wrote a new script for a video several days ago. Does that mean there will be a video soon? I hope so, but I’m not so sure since I do have plans for travelling. Regardless, we are back in production! It’s only a matter of time for the release of a new episode. The camera I bought to replace my old Canon ELURA 100 is a Canon Optura 400 . I actually was not considering it in the beginning because it was priced at $1200, which is way out of my price range. I was trying to decide between getting another Canon ELURA 100 or a Panasonic GS320 , both of which I can buy new at about $350. But when I saw that I could get a refurbished Canon Optura 400 for about the same price, I decided to go for it. I was a little reluctant to buy refurbished stuff, because I don’t know if there would be problems, but that was a huge saving and I wanted to try it out. As of right now, I’ve played around with the new camera but I haven’t really recorded anything yet. I’ll write more about it once I’ve actually filmed some stuff with it. That is a really great deal. I have always been hesitant to buy refurbished, so I’ll be interested to see what you think of the product. Yeah, we’ll see, but so far it’s not that different from new, except the packaging.